The Ridge House on Center Street in Fayetteville. An influential Cherokee family's legacy with ties to Fayetteville's past and present is being featured in a series of events Feb. 18-21, including a walking tour on the square to visit related historic sites. "A Ridge and Boudinot Walking Tour on the Fayetteville Square" will take place at noon Wednesday, Feb. 20, starting in the Atrium at One East Center on the Fayetteville Square with a reception to follow. The tour and reception are both free and open to the public. Sean Teuton, associate professor of English, director of indigenous studies, and an enrolled citizen of the Cherokee Nation, and Kim Sexton, associate professor of architectural history in the Fay Jones School of Architecture and Design, will lead the tour. Teuton and Sexton will visit and talk about several historical sites connected to John Ridge and Elias Cornelius Boudinot. This event is part of a series of events centered on modern-day playwright Mary Kathryn Nagle, her ancestor John Ridge and his influential Cherokee family's legacy. Partners and sponsors for these events include Crystal Bridges Museum of American Art, TheatreSquared, the Northwest Arkansas Center for Sexual Assault, the U of A Chancellor's Innovation and Collaboration Grant, University Libraries' Special Collections and Mullins Library, and the J. William Fulbright College of Arts and Sciences' Indigenous Studies Program, Humanities Program and Department of Theatre. About John Ridge: John Ridge signed the bitterly divisive Treaty of New Echota in 1835, which removed the Cherokees from their land in the eastern United States. While many view Ridge and the other Ridge-Watie family signers as traitors, others see them as dissenting patriots who were willing to sacrifice their own lives to preserve the Cherokee Nation — having no idea of the atrocity that was to come through the Trail of Tears. After Ridge was killed in the Indian Territory, his widow, Sarah Bird Northrup Ridge, their five children and a teacher, Sophia Sawyer, moved to Fayetteville in 1839. 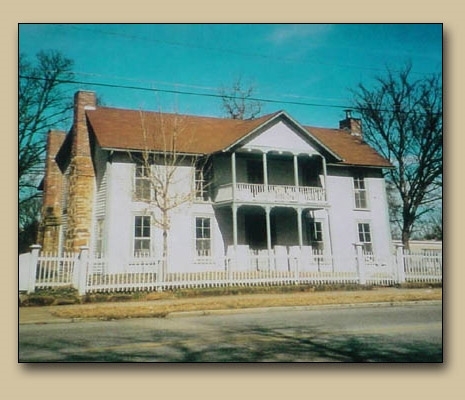 Their home, The Ridge House, located just off the downtown Fayetteville Square, is the oldest house still standing in Fayetteville. About Elias Cornelius Boudinot: As a Cherokee, a Confederate, an attorney and a politician, Elias Cornelius Boudinot continues to provoke mixed feelings today. Boudinot was born in 1835 to Elias Boudinot and Harriet Ruggles Gold at the Cherokee capital of New Echota in what is now Georgia. Boudinot's father and his father's cousin, John Ridge, were two of the Cherokee leaders who signed the divisive treaty that led to the forced removal of the tribe — and both were killed in 1839. The Boudinot children were sent east to live with family. In 1853 Elias Cornelius Boudinot returned west, arriving in Fayetteville in 1853, where he reconnected with Ridge's widow, Sarah Bird Northrup Ridge. Boudinot studied law, established the Arkansian newspaper, entered local politics, and was elected to Fayetteville's first city council. He served as secretary of the Arkansas secession convention and, after Arkansas seceded, became a colonel in the Confederate Army and represented Arkansas in the Confederate Congress.